elegant timeless classics design for bedroom and sofa living ,dinning,for your young heart. 1.Mrniu Faux Line cushion cover perfect decorative for sofa,couch, chairs, bed, school, Chaises Longues,Corner,Love Seats,living room,bedroom for travel and naps. 4.elegant timeless classics pillow cases are available in a variety of vibrant colors, you can easily find the perfect color to match or complement your sofa or loveseat. 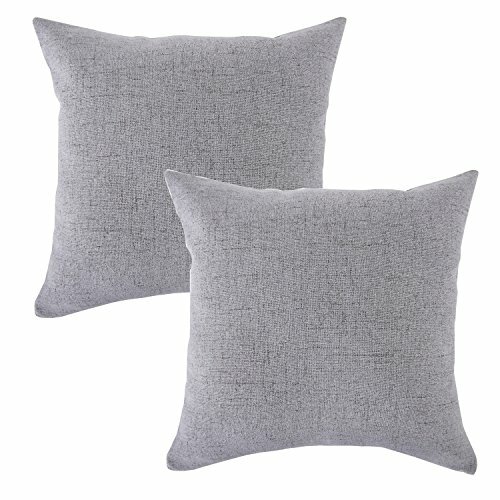 5.Throw pillow slip is made of 100% ultra quality polyester,Machine washable. Is This Machine Washable?If The Pillowcase Fastening Is Buttons, Poppers Or Just Envelope Opening? Is The Price 8.68 For One Piece Or 2 Its Not Very Clear? Is The Color True To Colour Advertised? –>The Product Colour May Vary From The Pictures Due To Differences In Screen Displays. ✔ CUSHION CASES:Invisible Zipper Design For Insertion And Removal In Handy ,With Artistic Appearance,Please Note Picture Color Due To Differences In Screen Displays.